Better Slip Resistance: Thickened rubber sole has excellent durability and wear resistance, soft enough to prevent your toe from rubbing. Fine Air Permeability & Quick Dry: Breathable fabric with mesh sole ensuring continued air circulation, which helps your feet stay dry and comfortable. Ultra-Light & Ultra-Portable: Soft fabrics and rubber sole can be folded freely, easy to carry and store. The upper with stitching extended to the rubber sole without fear of tearing and detached. Occasion: Beach, swimming pool, swimming, diving, yoga, weight training, wake-boarding, sailing, boating, kayaking, windsurfing, cycling, jogging, walking, fishing, beach volleyball, gardening, lawn, car-washing, etc. Various Size Available: Features a stretch fabric upper that accommodates most small and wide widths comfortably. From 4.5 to 13 for Women and Men. Notice: Please read carefully of the size chart before order, this is the most effective way to choose the shoes that best suits you. 1. Ultra – Light: Only 5.67 Oz, as light as socks. 2. Soft & Ultra – Portable: Made of premium nylon fabrics and rubber, very comfortable to wear and easy to fold. 4. Better Slip Resistance: Upgrade non-slip soles to ensure your safety of walking on slippery surfaces. If you have any quality problems or complaints within 12 months after you purchased, please feel free to contact us and we will give you a perfect solution within 24h. 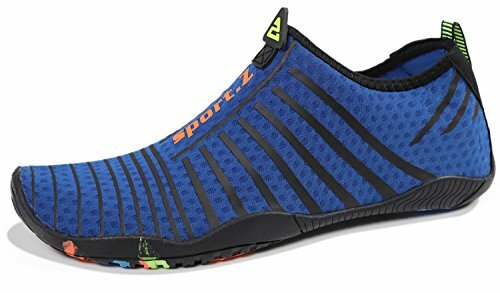 SIMARI Womens and Mens Water Shoes Quick-Dry Aqua Socks Barefoot for Outdoor Beach Swim Surf Yoga Exer..
YALOX Men Women's Water Shoes Outdoor Beach Swimming Aqua Socks Quick-Dry Barefoot Shoes for Surfing Y..